The Good Times Blog: Electronic Voting Machine Error May Force Overturn of Election Results! Electronic Voting Machine Error May Force Overturn of Election Results! The results of the Waldenburg, Arkansas Mayoral election are being called into question after one candidate discovered that some votes cast for him may not have been counted*. Randy Wooten knows that he received at least 1 vote in last Tuesday’s election, because he voted for himself. However, when his wife went to City Hall to review the election results, the tally showed that Wooten had received zero votes. The incumbent mayor and a third challenger each received 18 votes (Population of Waldenberg, AK = 80) and a run-off for these 2 challengers is scheduled for the end of the month. Wooten claims that 8 or 9 people also told him they had cast their votes for him (liars) and is contemplating a legal challenge of the results. 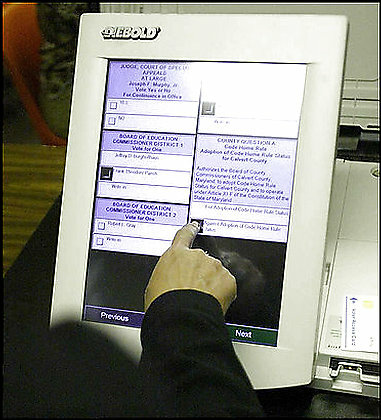 Waldenburg uses electronic voting machines, but paper ballots were also made available. If Wooten chooses to take this case to court, he may be able to expose some of the loopholes that are rumored to plague electronic voting technology. He also may be able to expose the holes in his marriage since clearly his wife didn’t vote for him, and in his friendships since at least 10% of the population of his town lied to him about who they had voted for. *I bet that headline scared you into reading this story because you thought when I said “Overturn” I might be talking about a race you actually cared about and if this is the case…to you I say…shame on you, all elections are important to someone. Jerk. Now that the election is all said and done, or not. All elections are meaningful. If you can vote, you should vote. It is among our most valuable rights and most important responsibilities. Have we all heard the great things that are happening in Kay Harris' old House district? Well, they seem to be missing some 18,000 votes and are conducting a recount. Previous election results favored the GOP, however, things may be looking up for us. Here, here! I agree that if you can vote, you should vote. I mean, if baby Caroline can go to the polls not once but twice in one day - once with Mom and once with Dad (she's a sticker-junkie) - then the average Joe should be able to make it there, too. Hmm... Missing votes. I can bet I know who those belonged to. Happy Birthday Good Times Blog! Happy Halloween from the GTB!